The latest edition of MLB Network Presents is a home run. Given the incredible amount of archival footage that Major League Baseball has access to, I have been begging for more of the MLB Network Presents documentaries to take advantage of that footage and focus on players and stories from the 1960s, 1970s, and 1980s. I think they hit it out of the park with December of 2017’s Billy, centered on Billy Martin, and I think they did it again with this week’s Bench, spotlighting Cincinnati Reds Hall of Fame catcher Johnny Bench. The film begins with the 71-year old Bench at his home in Palm Beach Gardens, Florida, where he’s raising his sons, 12-year old Justin and 9-year old Josh, as a single father. With his trademark cool demeanor, Bench cooks breakfast for his sons and describes a daily routine that is far removed from the spotlight he once knew. In a visit to Binger, Oklahoma – population 700 – where Bench was born and raised, those who’ve known Bench the longest describe the small town that informed his persona and work ethic, and their shared connection with a sports legend who never forgot where he came from. The run-time on this feature, without commercials, is over an hour, making it one of the longer (if not the longest) editions of MLB Network Presents. The film opens and closes with Bench’s life today in Florida with his two young sons, but the bulk of this film is spent on Bench’s career. His early years growing up in Oklahoma are discussed, and interviews with friends and others he grew up with are featured. The film then transitions into the early years of his pro career, with plenty of time spent on the discovery of a benign growth on Bench’s lung in 1972 and the emotional (and physical) impact that had on him. 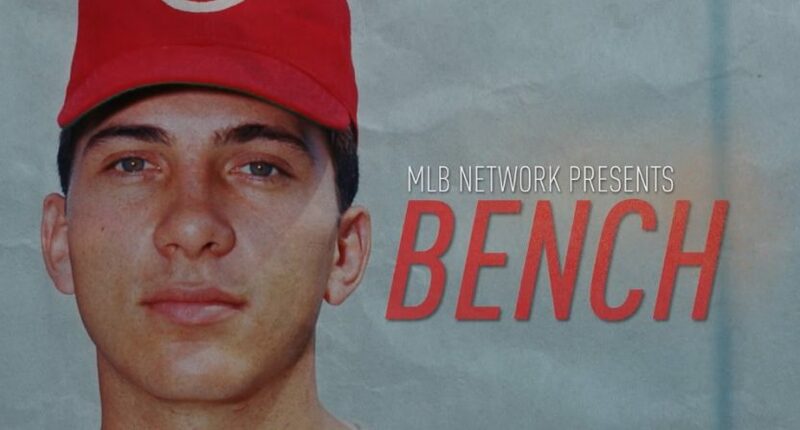 What makes @JohnnyBench_5 was one of the greatest baseball players and personalities ever? I don’t think any MLB Network Presents film has had this amount of star-level interviews. Bench is (of course) featured, as are Big Red Machine teammates Tony Perez and Pete Rose, fellow Hall of Famer Reggie Jackson, broadcasters Al Michaels (who was the Reds’ primary play-by-play broadcaster for a couple of years in the 70s when Bench was with the team) and Brent Musburger, and long-time friends Toby Keith and Bobby Knight. It’s a hodgepodge of guests from a variety of backgrounds, but it works out well because of how well they all know Bench. As mentioned earlier, the use of archival footage is incredible. There’s plenty of video from Johnny Bench Night at Riverfront Stadium, featuring Bench hitting the final home run of his career. There’s footage of Bench getting the call that he’s been elected to the Hall of Fame, complete with him pouring champagne for his guests. There’s plenty of footage of Bench off the field, including on TV shows and USO tours with Bob Hope. The usage of old footage should be the model going forward for these films. My mind was somewhat blown near the end of the film, when Rose admitted that Bench should have been the person most upset with him for his suspension and lifetime ban from baseball for gambling, because it took the focus away from Bench’s Hall of Fame induction (at that time, he was elected with the third-highest percentage of votes ever, behind only Ty Cobb and Hank Aaron). I had never heard that story, and the rare bit of humility from Rose was refreshing. All in all, these are the types of documentaries I adore. Bench featured a legendary player who had a compelling career, and there was plenty of footage to supplement a wide variety of interviews, including with the man himself. These players aren’t going to be around forever, and I would love to see more content focusing on legends like Bench than on players from say, the 1990s. How about Hank Aaron and Willie Mays next?